Whatever you may think about the so-called feud and the people involved, at the end of the day, these are human beings and to circulate footage of a man being butchered on a city street is akin to circulating a snuff movie. It is grotesque and does society a huge disservice. If we allow these victims to be dehumanised in such a way then we, as a society, abdicate responsibility for maintaining law and order and protecting all citizens equally. Posted in Misc and tagged Gareth Hutch, Gary Gannon at 3:47 pm on May 25, 2016 by Broadsheet. If the victim was from mayo it wouldn’t happen. i looked at the video. I agree it is prurient in the extreme. It also does not look like stationary CCTV, it looks like someone was shooting it, controlling the direction of the camera. They were filming the CCTV footage on a screen. Are you serious? You can’t actually process that this was someone filming something from a screen? Jake38 is the reason that conspiracy theories exist. Don’t give up the day job Kojak. Do you think this video is sexual? It that was the murder of a nice professional from Donnybrook then not one Irish media outlet would have posted that. It’s more of this social apartheid where different social classes are treated entirely differently by the state and by the media. It’s beyond wrong a major social justice issue. If it was the murder of a carpenter from the north inner city they wouldn’t have posted it either. It was the murder of a murderer and violent criminal, so i guess they think the gloves are off. Not saying thats right but that’s what it is, not your self hating version of events. Relax there Rotide. Do you think the points you make aren’t enough, so you have to resort to a personal attack as well? It’s not really a personal atack. The example you made screams ‘agenda’ , Merely adressing that. Playing that particular ball, not the man. Not like I’m Moyest! You might need to watch what you say. The only mention of a link between Gareth Hutch and crime that I’ve seen in the media is that he was arrested but subsequently acquitted of involvement in a cash in transit robbery. What is known is that he worked part time in construction and part time as a taxi driver and that he lived in a council flat. What are you basing your “It was the murder of a murderer and violent criminal” statement on? For example the Cliffs of Moher dude. 64 year old celebrity lawyer. Has he been named yet? Okay but it was euphemistically reported and then all but dropped. He just happened to be connected in the correct ways to the media. It’s a fairly serious indictment of Irish journalism how easy it is to suppress news. I don’t know the story you’re talking about but it might be an ‘Is it in the public interest’ decision. 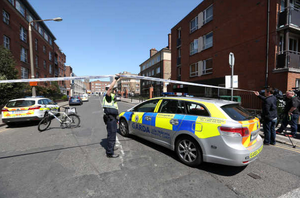 Criminals shooting each other all over Dublin is a definite ‘Yes’. More unquestioned pro Social Democrat nonsense from Broadsheet – Gary Gannon lives in Santry. “Father-of-One”, how about “Armed robber”? Good riddance. Crap video, they cut off the interesting part. Couldnt care less about those numpties, they are so dumb as to kill each other, let them. What about the killing of an innocent civilian through mistaken identity? Was referring to Gers comment that they should be allowed to kill each other. The issue with that moronic statement is that they don’t just kill each other. As said below, nobody deserves to be killed and we should show some respect. We do not have execution in this country. When someone is murdered it is inapposite whether he had committed crime or was a banker or a sweetshop manager. The person has been killed, and we should back off and show some respect. Well I remember the day ‘the General’ was killed; went into Bewley’s and there were people with white faces and eyes red from crying. Nobody deserves to be killed. People with white faces and eyes red from crying over the death of that man deserve to be ashamed of themselves. Agreed. What sort of scum would mourn that guy? Same when people speak about the ‘innocent victim’ who was shot a few weeks ago. They’re all innocent. Why do the media claim the ones who were mistakingly shot as innocent? Implying all others were guilty, and some-what deserving. To make it a bit more simple: If you’re let’s say an electrician, you can expect to encounter electricity. If you’re not careful, this electricity can harm you. if you engage in criminal activities with criminal gangs, you can expect to encounter gun violence. If you’re not careful, this gun violence can harm you. Has that made it any simpler? Yes, it has made you simpler alright. You think these people deserve to die? rotide there is a bit a tough guy, lives a hard life, in his mother’s basement, strangling bunnies, accepting life’s inescapable hard truths, unlike us. Ah come on now. Don’t be silly. How many houses have basements in Ireland. He’s in her converted garage. These people would shoot you if the price was right. Do they deserve to die? No but they have very little regard for your or anyone else’s safety. I wonder what part of “Your life is in danger” the poor guy didn’t understand? Walking around like that when even the dogs in the street know there’s up to 100K of a bounty for the murder of a family member. That footage should be shown on the six one news. People don’t care. People have no idea who quickly a life can be taken. How brutal and simple it can be. You watch a video like that and it effects you. That’s how things change. Actually seeing the reality of it. Show it and you risk desensitising people to it like the charity ads showing starving Africans. Huge impact when first shown and now people just ignore them as they’re common place. If those ads didn’t get results they wouldn’t still be used. However they may well be less effective as when they first graced our screens. His 6 year old son wouldn’t care? He brought it on himself, he was a gangster, the sooner they are killed off, the better. Makes no difference if the public get to see him killed or not. Id say the lady who filmed the footage on the screen and stupidly spoke during it is in big trouble now – oops! The Kinehens will be wipes out. Only a matter of time.